Masaaki Yuasa is without a doubt one of anime’s most unique voices; someone worthy of the endless praise he receives as an inventive director, but also a bit of an unsung hero as an actual animator. His particular brand of expressionism and relentless pursuit of love in unexpected corners make him a personal favorite of mine. So here’s the story of his new studio, and how tools can get in the way of the artist even if they’re not intrinsically bad. I don’t intend this to become a full retrospective of Yuasa’s career. The time might come for that, but this is the story of the company he recently founded rather than of the artist himself. Back in June 2014 it was revealed that Yuasa and his trustworthy companion Eunyoung Choi had created their own studio: Science Saru. Their first task was animating an episode of Adventure Time directed by Yuasa himself. That debut was no coincidence, since it represented the goals they’d be majorly chasing – internationally-minded work, and a very clean Flash-based aesthetic. That wasn’t the beginning of it either, since Yuasa’s previous production Ping Pong had already been aided by Flash in a major way. And if you look further back, there were some hints about arguments about the artistic vision within the crew as well. As you might be aware if you follow individual creators, Michio Mihara had been an integral part of Yuasa’s work; he directed, wrote, supervised and entirely animated episodes in all of Yuasa’s TV anime, then went on to become the character designer of KICK HEART. It was quite the surprise to read his tweets which, after praising Eunyoung Choi’s episode of Space Dandy that had just aired, declared he wouldn’t work with her again – and thus break his bond with Yuasa, who is obviously tied to Choi now. That’s a promise he followed through on, not coming to their aid during Ping Pong despite its very troubled production that could have used him. There were rumors that this all started due to disagreements over the usage of Flash, something that seemed minor back then but that has been gaining credence with the passage of time. We might never come to know the full story (it was only recently that the rumors about Mitsuo Iso and Takeshi Honda’s in-fight during Dennou Coil were casually confirmed) and he doesn’t seem to have personal issues with his old pal anyway, but it’s always been clear that the Flash route didn’t please everyone. If you’ve come here expecting a rant against modern tools as a whole and digital animation though, I’m afraid you won’t be pleased. Those of you who don’t even consider animation drawn on tablets rather than paper to be hand-drawn aren’t only wrong, but reading a blog that has always been advocating it as a potentially fantastic avenue. The so-called webgen artists have been featured prominently on this site since its conception for good reason. Their mere presence, coexisting with traditionally-aligned animators, has made the anime landscape richer than ever. And on a personal level, I’ve always been attracted to the work of many digital animators. 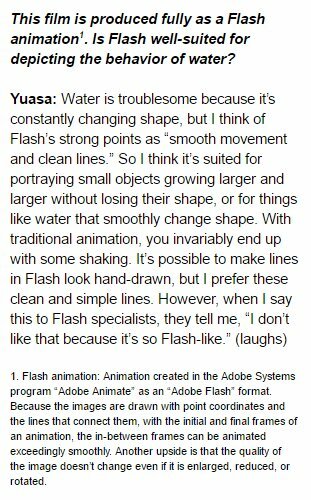 Flash itself isn’t the issue either, as one of my favorite sequences in recent times was animated entirely using it; obviously there are a bunch more of options artists within the industry use, but Flash is the tool of choice for many of them. Finding applications of it that are both technically strong and indistinct to the eyes of most viewers isn’t even a recent thing, as people like ryochimo achieved it many years ago. So if the issue isn’t inherent in the tech, what is it? Its actual usage, as with everything else. Let’s look at Science Saru’s approach to Flash animation, then. In the days that predated the studio itself it wasn’t much of an issue; it made some sequences in Ping Pong stand out poorly and there were some people who spoke against its effects on the in-betweening process, but it wasn’t a huge deal either way. When you look at the promotional videos for their modern work like Yoru wa Mijikashi Aruke yo Otome it’s clear that Flash has taken the center stage, and that’s had noticeable effects on the overall visuals. To make this perfectly fair, let me begin by pointing out that there are obvious advantages to it; the trailers are full of neat sequences of background animation, zooming in and changing perspectives in ways that traditional craft would deem painstakingly hard. This is made much simpler when elements are treated as objects that can be altered rather than pure drawings. I feel like a movie like Mijikashi is the kind of material this approach is inherently most compatible with too; heavily stylized designs and world, and an already flat look. If they’re careful with the linework, I can see this film being just as strong as its sibling Tatami Galaxy; perhaps not a clear net positive change, but so far it looks to have gained in some respects to make the downsides easier to look past. His original film Lu Over The Wall (and judging by the short teaser, perhaps Devilman Crybaby as well) don’t fare similarly, however. One scene from Lu’s teasers in particular has been quite the source of criticism, despite involving creators beloved by the animation community. 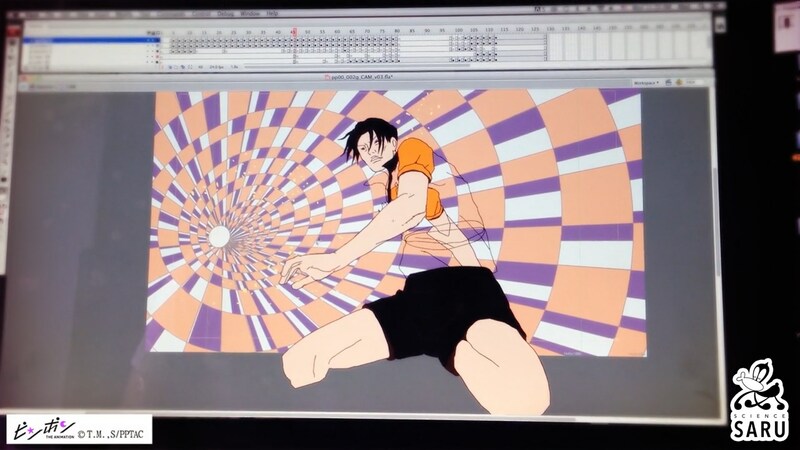 The official Twitter account shared this piece showcasing the process that the legend Shinya Ohira’s animation went through, which I can only describe as soul-crushing. The end result is still a very impressive scene, but there’s something irreparably lost the moment it switches to vector graphics. For every flashy (heh heh) scene this enables, you get plenty of unnaturally clean sequences, where art and animation feel entirely at odds; seeing messy events depicted through appropriately chaotic movement that in the end look this bizarrely hygienic is something that really weirds me out. Yuasa is an artist who truly understands the power of deformation, who can weaponize the countless small inconsistencies born when switching perspectives by hand. Paying a big price to refine some of those ambitious moving camera cuts seems like a poor idea. Recently I talked about the fallacy of linking polish with soulless animation, but this isn’t the same deal at all; it would be outrageous to claim something like Tatami Galaxy wasn’t already polished for one. This entire process Lu Over The Wall is going through brutally erodes its character, leaving behind only inert lines. The movement itself is mostly fine – though through rerigging it can become weirdly even and fluid in some instances – but it’s the drawings themselves that lose any organic feel. While it’s easy to point at both and call them “Flash animation”, this isn’t at all comparable to digital artists drawing on tablets to begin with. What you saw in the example above is animation drawn on paper and later processed, which to put it mildly had a noticeable impact on it. And Yuasa is neither dumb nor blind. He’s perfectly aware of the change in his upcoming work, which is not an accident but something he’s intentionally been moving towards. He’s even aware that it will have detractors – and you know what, he doesn’t care all that much! I can only respect his attitude, even if I’m deeply disappointed in the result. I’m fully aware that moreso than ever, this piece is rooted in aesthetic preferences. I’ve talked about this with people who also noticed the big aesthetic changes but were perfectly fine with them. Yuasa’s work isn’t suddenly less technically strong; if anything his current lineup seems like a huge step up from Ping Pong’s limitations and overall production madness. And yet I’m immensely bothered by it, which breaks my heart. Not enough to stop me from looking forward to watching and likely loving them, but I can’t imagine any of them standing up to the rest of his ouvre in my heart. Hopefully those of you who do enjoy the path Yuasa and Saru are taking – I’m thinking of people who are into modern US cartoons in general – will learn something from this as well. I’ll sit in my corner only being very excited for all of Yuasa’s new work. What a tragedy. This was quite tricky to write, not so much because of the content but to nail the tone. I love Yuasa yet passionately dislike this development, so striking a balance wasn’t easy. If you got conflicting feelings from it: welcome to my heart! These are both some of the most exciting upcoming anime projects and also ones I have major preemptive gripes about. I’m basically on the same camp, except that as an anime viewer I never really had a problem with Flash before. It’s really awkward to have this happen with one of my favorite directors. I do see what you mean about that process shot. The speed of that background makes me wish the animation was snappier. Its kind of disorienting because of that, but I still find it pretty appealing. I feel like amongst other things it lost a lot of force, which creates that awkward feeling with the background that actually blazes through. Funnily enough, I really like the effect that is created by this smoothed out, vectorized walk-cycle against the blazing background: It gives the monster an overpowering aura as “it doesn’t even need to make an effort to be this fast”. And I also really like the shot with the guy playing ukulele. What I dislike is the entirety of the Devilman PV – Especially the shot with the car. Doesn’t feel daunting at all to me – more like a half-assed animation project of an highschooler. Devilman will look horrible if the Flash is used heavily there. The damn thing should look rough and gritty, not clean. Why would you want your horror scenes to look smooth really. Somebody like Yoshimichi Kameda would have been prefect for it. When Devilman may not be my cup of tea, I do hope they make it a gross, messy Kemonozume-looking thing. I think that’s really the best way to adapt it. Devilman is going to be the Oshiyama collab – with him as a regular episode director I imagine. The timing and the comments about it being sexually charged fit perfectly. The same small group of people since the Pre-Saru days at Ping Pong are still in charge of that. As you’ve seen it’s not all animated with Flash from the ground though. I think it’s a mistake to not talk about the potential reduction in labor that this technique must give. Tweening is a very expensive part of most anime, and it’s also the most brutal and exploitative process of an already brutal and exploitative industry. It’s very demanding, gives a pittance of pay, and involves a lot less personal expression. If the techniques of Science Saru are reducing or eliminating tweening labor, not only does it save money, but it is probably more ethical as well.